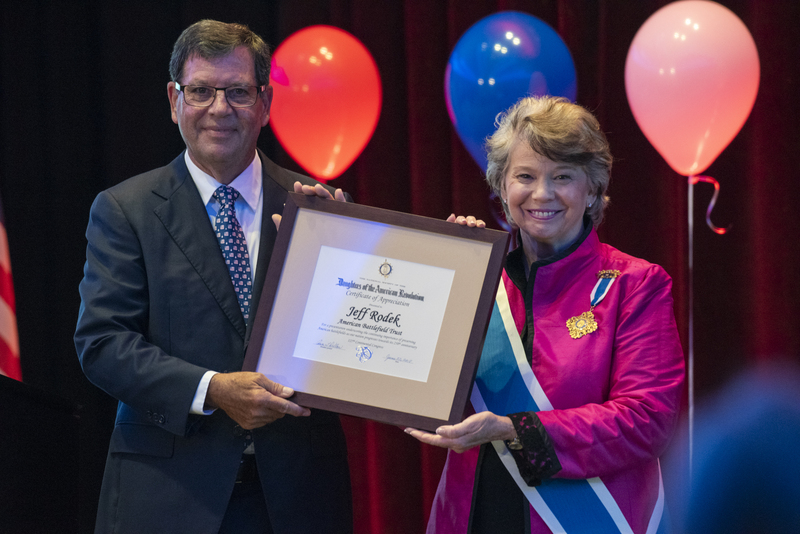 On June 22, 2018, American Battlefield Trust Chairman Jeff Rodek was honored to join nearly 2,000 DAR members during Service to America Night at their 127th Continental Congress in Washington, D.C., to discuss the Trust’s work in preserving Revolutionary War battlefields and how DAR members can help. In addition, the chairman offered DAR members an exclusive, introductory membership rate to join the Trust for just $17.76. The mission of the Daughters of the American Revolution to honor the patriots of the war that forged the United States is shared by the American Battlefield Trust, which preserves America’s hallowed battlegrounds and educates the public about what happened there and why it matters. To date, the Trust has saved more than 50,000 acres of battlefield land associated with the Revolutionary War, the War of 1812, and the Civil War in 24 states. According to the National Park Service, almost 70 percent of all battlefields lie within urban areas, making them extraordinary vulnerable to development. As a result, nearly 60 percent of Revolutionary War and War of 1812 battlefields are considered lost or so fragmented that their preservation value is extremely limited. In 2013, NPS asked the Trust to get involved and help save these endangered but important battlefields. In response, the Trust announced on Veterans Day 2014 that it was expanding its scope to include Revolutionary War and War of 1812 battlefields – then went straight to work. In less than four years, the Trust has saved or is in the process of saving nearly 2,000 acres associated with some of the most significant Revolutionary War battlefields in our nation’s history. It is also reassuring to know that we are not alone in the cause of preserving Revolutionary War history. Long before the Trust was founded in 1987, DAR has been intimately involved in memorializing the Revolutionary War. Since 1890, DAR has contributed millions of hours of volunteer work and millions of dollars in charitable donations, creating a lasting legacy that honors the patriots of the Revolution. Like the Trust, the DAR works tirelessly to preserve American history, promote patriotism, and educate our youth about how this nation was founded and what it means to be an American citizen. In short, there is a natural synergy between our two organizations. The Trust’s efforts to preserve the Waxhaws Battlefield is a testament to this synergy. In 2015, Trust staff visited the two-acre Waxhaws Battlefield county park in South Carolina, the location of the 1780 massacre of over 113 Continental soldiers by British-led Loyalist cavalry. The staff noticed one memorial marker erected in 1955 by the Waxhaws Chapter of the Daughters of the American Revolution. It was obvious that this rural battlefield, though distant from major cities, is still dear to the hearts of DAR members. Since that visit, the Trust has saved 51 more acres at Waxhaws, increasing the battlefield’s preserved land by 2,450 percent. Although we are two different organizations, we have aligned missions — to preserve and promote the battlefields of the Revolutionary War and to educate the public on why they are important, especially in advance of the 250th anniversary of the American Revolution. In a few short years, Americans will come together for the anniversary of our nation’s founding. The commemoration provides us with an unparalleled opportunity to celebrate the democratic ideals enshrined in the Declaration of Independence — principles that continue to guide us as a country and inspire freedom-yearning people around the globe. The American Battlefield Trust was honored to be selected by the U.S. Department of the Interior to serve as the national nonprofit partner to the United States Semiquincentennial Commission, working in tandem with the commission to plan and coordinate the commemoration. We look forward to working closely with DAR Honorary President General and Semiquincentennial Commissioner Lynn Forney Young in the years ahead on this landmark effort. The Trust is deeply appreciative of the kind invitation from President General Ann Turner Dillon to speak at the Congress. We would be honored to have the Daughters of the American Revolution join us in our mission to preserve America’s hallowed battlegrounds and educate the public about them. For more information about how to become a Trust member for $17.76, please visit www.battlefields.org/welcomeDAR.